Some dead forests are better off left to burn especially when drought and insects have killed the trees since Mother Nature has a way of taking care of itself to defend rebirth. Can we learn from Mother Nature of how if a pine cone can be defended in a natural way so the seeds are not harmed, so too can a new forest evolve from what we consider to be catastrophic events. Can man learn how to defend wood structures that provide one of man's life essentials, which gives us shelter, from fire that is consuming our homes and buildings today at an alarming rate. Can we defend wood-framed buildings from the advance of wild fires that are consuming thousands of homes each year with chemistry like Mother Nature does, without toxic fire retardants that kill and destroy fish and vegetation? In the first years after a major fire, new vistas appear while the lush growth of new, young trees emerges from the burned ground. Today, decades after the 1988 fires, those young trees are renewed forests, once again filling in vistas. Some visitors still feel the Yellowstone they knew and loved is gone forever. But Yellowstone is not a museum— it is a functioning ecosystem in which fire plays a vital role. a lodgepole pine tree was opened by fire, allowing it to release its seeds. The vegetation in the Greater Yellowstone Ecosystem has adapted to fire and in some cases is dependent on it. Some plant communities depend on the removal of the forest canopy to become established. They are the first to inhabit sites after a fire. Other plants growing on the forest floor are adapted to survive at a subsistence level for long periods of time until fires open the canopy. Fire creates a landscape more diverse in age, which reduces the probability of disease or fire spreading through large areas. One of the two types of cones produced by lodgepole pines, which make up nearly 80% of the park’s forests, is serotinous. Serotinous cones will not release their seeds until the resin sealing them melts, requiring a temperature of at least 113°F (45°C). This adaptation helps ensure the seeds do not disperse until fire creates conditions that favor the establishment of lodgepole pine seedlings: diminished litter on the forest floor and plenty of sunlight through an open canopy. 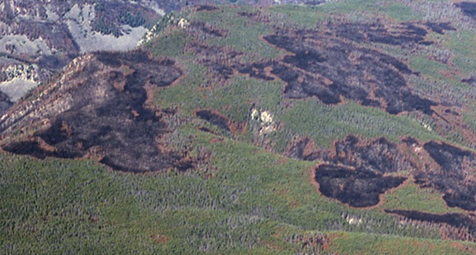 Fire can limit trees in the grasslands of Yellowstone, such as the Lamar and Hayden valleys. For example, Douglas-fir seeds require conditions that exist only in rare microhabitats in these grasslands. If a seed reaches such a microhabitat during a favorable year, a seedling may develop. Once the tree is growing, it begins to influence the immediate environment. More tree habitat is created and a small forest island eventually appears. Periodic fire kills the small trees before they have a chance to become islands, thus maintaining the grassland. Mature Douglas-fir trees have thick bark that resists damage by surface fires. In the past in areas like the park’s northern range, frequent surface fire kept most young trees from becoming part of the overstory. The widely scattered, large, fire-scarred trees in some of the dense Douglas-fir stands in the northern range are probably remnants of these communities. Although Engelmann spruce and subalpine fir are thin-barked, they grow in cool, moist habitats where conditions that enable fires to burn are infrequent. In 1988, 28% of the park’s whitebark pine burned, though it grows in open, cold, high-altitude habitats that accumulate fuel very slowly and have only a short season between snowmelt and snowfall during which fires can ignite and carry. Caches of whitebark pine seeds collected by red squirrels and Clark’s nutcrackers and the hardiness of whitebark pine seedlings on exposed sites give this tree an initial advantage in large burned areas over conifers dependent on wind to disperse seeds. However, this slow- growing and long-lived tree is typically more than 60 years old before reaching full cone production, and young trees may die before reproducing if the interval between fires is too short or if faster- growing conifers overtake them. Tree seedlings sprout and grow at variable rates between the surviving trees and the fallen and standing snags. As root systems of standing dead trees decay and lose their grip on the soil, the trees fall— sometimes hundreds at once by the presence of a strong wind. However, many trees remain upright for more than a decade after dying by fire or other cause. Fires may stimulate regeneration of sagebrush, aspen, and willows, but their growth is also affected by other influences such as climate and wildlife browsing. Aspen have thin bark, but the clones are connected by a network of underground roots that can survive even very hot surface and crown fires. 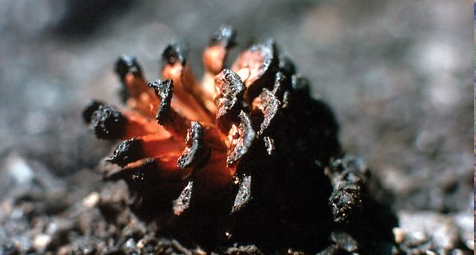 Although the above-ground stems may be killed, fire stimulates the sprouting of suckers from the roots, and fire leaves bare mineral soil suitable for the establishment of aspen seedlings. This 45 Year Lumber Building Expert Is Paying Attention To Mother Nature. 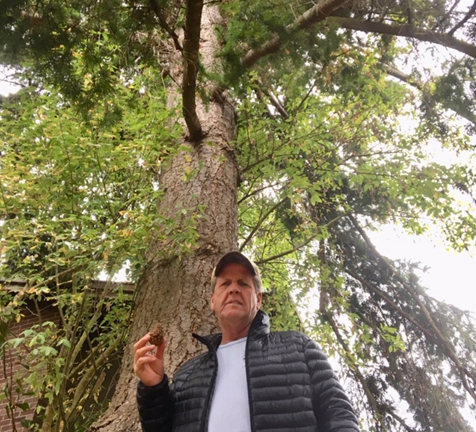 Since the late 1990’s, this building expert has taken tours to reforestation programs and is now out to bring the carbon sequester value of trees that turn into lumber to the the building industry. The goal is to help others understand the value of trying to meet the demands for housing with renewable sustainable lumber so we can recognize our shelters, as carbon storage banks, when lumber is defended from fire- the only way a building can release the stored carbon. Right down the middle, non-partisan, his goal is that we all live comfortably but we all contribute daily to emissions that trees sequester to support fiber growth and strength. Soils in Yellowstone that support little vegetation have been largely unaffected by fire. Soils that have dense, diverse vegetation before a fire are likely to respond quickly after the fire with a variety of species and nearly complete cover. Though above-ground parts of grasses and forbs are consumed by flames, the below-ground root systems typically remain unharmed, and for a few years after fire these plants commonly increase in productivity because fire rapidly releases nutrients from wood and forest litter. The regrowth of plant communities begins as soon as moisture is available, which may be within days at some sites. Plant growth was unusually lush in the first years after the 1988 fires because of the mineral nutrients in the ash and increased sunlight on the forest floor. Moss an inch or more thick became established in burned soils, and may have been a factor in moisture retention, promoting revegetation and slowing erosion. The amount of soil loss and sediment deposits in streams after the 1988 fires varied greatly. Although extensive erosion and mud slides occurred along the Gibbon River after heavy rains in the summer of 1989, it is not known how much the fires contributed to this. Vegetation regrowth slowed this erosion by 1991. About a quarter of the Yellowstone Lake and Lewis Lake watersheds and half of the Heart Lake watershed burned to some extent, but no significant changes have been detected in stream bank erosion, substrate composition, channel morphology, nutrient enrichment, or plankton production, nor have any discernible fire-related effects been observed in the fish populations in the six rivers that have been monitored regularly since 1988.